Jay Keller of Space Architects + Planners presents plans for 1038 N. Ashland Ave.
East Village Association members unanimously backed plans to convert offices to apartments at 1038 N. Ashland Ave.
Honore Holdings founder Michael Schenouda plans to convert the MIS Computer Corp. office building to 18 apartments and a property management office. Architect Jay Keller of Space Architects + Planners says renovations will keep the red-brick exterior intact. Architectural renderings call for 2 studio, 12 1-bedroom and 4 2-bedroom apartments, ranging from 424 to 915 square feet. Large windows would be restored along Ashland Avenue, with additional windows replacing the spray-painted mural along Cortez Street. EVA planning chair Brian Foote noted that apartments restore the existing building, feature larger units and include onsite management. President Dan Johnson agreed that new construction in the transit zone tends to look instead like "an invasion from another planet." The EVA vote is advisory to Ald. Proco Joe Moreno, who must recommend a zoning change from B1-2 to B2-3, plus Transit Oriented Development incentives to waive parking requirements. The building is two blocks from the CTA Blue Line station at Division. Apartments would not qualify for residential permit parking. EVA may be asked to aid a development it originally tried to stop. The city Landmarks Commission disregarded EVA protests and allowed MCZ Development to raze the Pure Dairy building at 1938 W. Augusta Blvd. Commission members urged the developer to work with EVA on a building design. Yet commissioners last month rejected MCZ's resulting plan, produced with EVA input and approved by landmark staff. Foote offered to explain EVA's interest in preserving the original building's Art Deco brickwork. New construction under way includes the 15-story Wicker Park Connection tower, Ace on Ashland condos and Ashland church apartments. 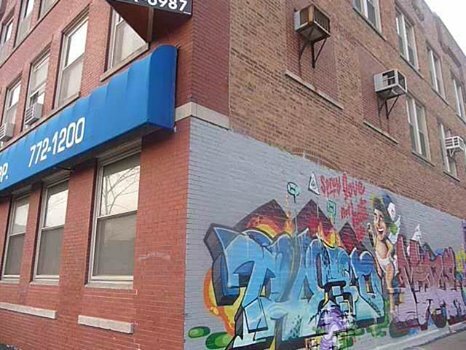 Gallery space is open at 1709 W. Chicago Ave., above future restaurant space being billed as a German barbecue. An open house is set for 6:30pm Tuesday at Northwest Settlement, 1400 W. Augusta Blvd., to show construction plans at the St. Boniface site, said Bob Zwolinski, who represents EVA in community efforts to preserve the church. The Polish Triangle Coalition seeks volunteers from the business and design community to support capital plans and events at the Division-Ashland-Milwaukee plaza. The half-hour membership meeting at Happy Village, 1059 N. Wolcott Ave., started with a presentation from Dream Dinners manager Rachel Veltman. The business at 740 N. Damen Ave. provides recipes to assemble in store, cook at home and freeze for future meals.